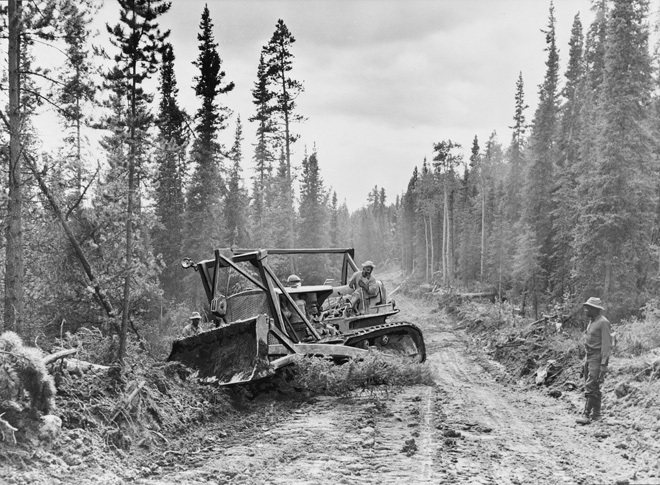 A caterpillar tractor with grader widens the roadway of the Alaska Highway, 1942. Until the early 1940s, Alaska was a neglected U.S. territory. The Klondike gold rush of the 1880s and ’90s was a distant memory, and oil had not yet been discovered. There were a bunch of trees and rivers and snow, but nothing really worth exploiting, so the vast wilderness was pretty much left to the bears and the hardy few who lived on the frontier. Although proposals had existed since the 1920s for building a highway through western Canada into Alaska, the Canadian government wasn’t very keen, and the plans were shelved. Russia’s armed “aerosleds” may look like science fiction, but they’re a real part of Russia’s history. As invading armies tried merely to survive the intense Russian winters, the Russians thrived, due in large part to the bizarre, Star Wars-esque snowcraft. The Soviet partisans were members of a resistance movement which fought a guerrilla war against the Axis occupation of the Soviet Union during World War II. The movement was coordinated and controlled by the Soviet government and modeled on that of the Red Army. The primary objective of the guerrilla warfare waged by the Soviet partisan units was the disruption of the Eastern Front’s German rear, especially road and railroad communications. Blood on the Shores [Amazon] is both a first-person account and a meticulously researched study of Soviet naval special operations forces in World War II. It is based on the 1957 memoirs of Twice Hero of the Soviet Union Viktor Leonov, who commanded in combat the reconnaissance detachments of the Northern and Pacific fleets. Leonov describes his entry into the elite Northern Fleet naval scout unit in July 1941 and the tactical and operational raids that followed against German forces based in Norway from 1941 through 1944. His story climaxes in the Far East, where Leonov’s Pacific Fleet detachment distinguished itself in daring amphibious landings into Japanese-held Korean ports in advance of Soviet main naval and ground forces. The translator’s introduction and other materials reveal another significant activity of Soviet naval intelligence – the insertion of Soviet and Norwegian intelligence operatives deep into the German rear in Norway by submarine and parachute. These men monitored German ship traffic from Tromso northward, providing timely and accurate intelligence reports directly to Northern Fleet headquarters. When German counterintelligence rounded up and destroyed this agent net, Leonov’s detachment assumed the mission. Because Leonov could not describe these highly secretive activities in 1957 when his memoir was first published in the Soviet Union, the translator’s contributions to this work are crucial to a fuller understanding of the scope of Soviet naval special operations and intelligence activities in World War II. Historical documentation found in recently opened Russian archives, a survey of the scout detachments of other fleets, captured German documents, and an extensive bibliography help make this a useful reference book as well as an entertaining read about the exploits of these legendary naval commandos. Editor’s note: I read this book as a teenager and remember it to this day. I remember my father buying this book at a Detroit gas station for $1.99. Definately a re-read!